Which results are you more likely to click on? How often are you looking past the top three results? On-page HTML structure, keyword usage, website architecture, page content, inbound links and domain collective content make up just a fraction of the criteria used in assessing who is going to be prized with that sought after higher ranking. Due to online consumer behavior, ranking higher than your competitors has never been so important. But ranking on the first page of results is not enough anymore, you need to rank number 1 (or at least in the top three). Are you ranking in the top three? What about the first page? So, Why is Ecommerce SEO Important? The success of ecommerce websites is relying more heavily on SEO, more than any other platform, in order to acquire unpaid, organic traffic to convert into online sales. A recent study shows that SEO is accountable for about 30% of E-commerce sites traffic, which is a substantial figure when put into the context of potential revenue opportunities. There is no question that lower ranked websites will be missing out on this potential revenue so it is paramount that your site is SEO friendly. However, due to their high page volume, pages with low count content, and duplicate content, ecommerce websites run the risk of being classified as spammy-feel by search engine algorithms. Search engines are clever, but not perfect, and in order to not damage your ranking your store’s exposure and therefore your sales, your site needs to be SEO friendly. Few people have a full understanding of the importance of ecommerce SEO and how quickly it has developed. SEO is now much more than just including the right keywords on a page – it touches on EVERY part of a website, so let me give you a brief rundown of the process. When a user goes on a search engine like Google, enters a query in the search bar and clicks enter, the search engine deploys bots, commonly referred to as “spiders” that crawl websites and index their content. If an important part of your website isn’t easily accessible, spiders will perceive it as unimportant and scurry off to other sites. Therefore, a good website architecture is a critical component of SEO as it lays the path for search engines to consider your content as relevant to that original organic search. Once the bots have scanned their index and compiled results, search algorithms determine the order in which the results will be displayed. Google, for example, uses over 200 signals to determine how each website ranks against one another. On-page SEO is composed of keywords strategically placed within the page to convey the purpose of that specific page to the search engine. Including variation around the main keyword is important. For example, a page about local artwork could include “local contemporary artwork” or “local scenic paintings”. Title and header tags are HTML components describing the content of the page, and they are important elements to consider for your on-page SEO. While the title tag appears on the search engine result page and the browser tab, both tags should include the primary keyword (and) the brand name. As spiders will also be crawling through the main body of content, include variations of the main keywords, but don’t try and force them in for the sake of it. Make sure you are using natural language,and limit acronyms, so that you provide an easier user experience. Following the update of the Panda Algorithm, content under 300 words might be discarded and penalized under the thin content category. To help you with your keywords, you can download our free keyword worksheet. We also have an article on 9 ways to boost SEO that covers some easy to implement strategies which can be used for your ecommerce SEO game plan as well! If your potential customers can’t find you, you won’t be making any sales. The best way to help potential customers to find you is by optimizing your website with keywords that your target customers will be searching for. Heading tags including H1, H2, H3, etc. can help you improve your website’s search engine ranking. But most people don’t know what it means, and many don’t know whether they are using it or not. In this ecommerce SEO guide, you will learn how headings work. Headings are HTML code that permits you to make some words stand out on the page of your website. For instance, the title of an article on a newspaper website is usually big and more pronounced than other words. So headings allow you to tell the search engine that some words are important. It is important to use H1 on your website to describe your keywords to help improve your ranking in search engine. How can I know if my website is using the H1 tag and other heading tags? You can repeat the same step for h2, h3, h4, h5, and h6. H1 tag is important because search engines always give more weight to it over other headings. So it is important to use the H1 tag properly on your website. Meta tags are texts that describe a page. Meta tags don’t appear on a website page, but in the page’s code. Once you are on a website page meta tags can only be seen by the search engine, not the site visitor. But, that doesn’t mean they are not important for the searcher. Meta tags also help someone searching about a specific topic get a glimpse into what your page is about. In a way they can be treated like a Twitter post your aim is to be engaging and relevant in order to increase your click through rates. Meta tags are generally cut off at 160 characters. There is no appropriate keyword % you should use, but one needs to be careful so that you don’t stuff your page to fit your keywords. According to Yoast SEO, the keyword percentage should be between 0.5 and 2.5%. Google doesn’t like keyword stuffing, and an ecommerce SEO strategy is no exception, so it is important to use an appropriate keyword % on your website. Broken links are links that lead you to error 404 pages, and it is important to fix these links if you have them on your site so that they don’t affect your page rankings. Broken links can be annoying and discouraging. When visitors to your website find out you have broken links, they’ll be discouraged and won’t want to explore the other pages on your website. So it is best for you to fix your broken links. How do I fix broken links? There are two types of broken links; internal links and external links. You can use this chrome extension to monitor and remove broken links and boost your website’s SEO. Well-researched keywords are crucial to the success of your website. Without profitable keywords, your website will not receive the kind of traffic that will drive revenue. SEO Keywords are the important words and phrases that help people find your website. Without them, no one will find your website. This is why you need to develop a list of keywords for your website. Targeting highly competitive keywords isn’t always the best choice, and that’s where you might want to consider using PPC for an added boost to appear on Google’s first page. So finding keywords with low competition is an important part of your ecommerce SEO strategy and that can be easily done using Google’s Keyword Planner. Keywords Everywhere – A seriously useful tool for Google keyword search volume and cost per click data on multiple websites. Keyword Sh**er – Can’t get anymore keywords then this. Bonus if you got Keywords Everywhere running, it’ll show you CPC and search volumes. Internal structure has to do with the way you link the pages of your website. It is important to link between the relevant pages of your website to keep visitors on your website for a longer time frame. Without proper linking of the pages of your website, the time visitors spend on your website will not increase and this lower your search rankings. So, ensure you link your website pages (that offer well produced content) and make navigating your site easy for the visitors this will lead to a more welcoming and engaging experience. Now that you know some of the key SEO components, learn more about how much SEO costs. Amp up your efforts with a search engine optimization worksheet to ensure you get the most out of your online marketing. Fill in the form below! If you’re looking to boost sales, then it’s important to optimize your website for mobile shoppers, and we’re still mentioning this because there are some companies that still haven’t updated their sites. Recent stats show that more people are shopping on their phones than their computers, with 50.3 percent of traffic coming from mobile devices and 49.7 percent coming from computers. People are browsing all the time… Wherever you are, on the train, waiting for a bus, and eating food out… you know there’s a good chance we’re scrolling. If you want your customers to purchase your products, make it easy for them to navigate your website. If your website is difficult to use, you will lose valuable business. Understand that your aim with each page is towards ONE key goal. Have a new product? Use your homepage to promote it! Homepages in most cases receive a high percentage of your overall website traffic. So, if you are not leveraging one, you are losing big time. Keeping your homepage fresh and up-to-date with your latest products can help to boost sales. But don’t overcrowd your site with a bunch of links to various products… that’s just plain ugly and will hurt your conversions. If your homepage is the most visited page on your website, and you don’t sell products you should still start promoting different offers there. You can offer something like a free ebook to get the visitor’s email or to promote an offer, ask for a call, and test how well it can convert. Thrive leads allows us to easily test different call to actions and implements the best converting CTA for you. Gone are the days of only one standard form of payment. Offering a wide variety of payment options will make it easier for shoppers to pay, helping to improve sales. Do you know a lot of people will cancel their purchases if their preferred payment option is not on your site? If you have no alternative payment options on your website, the number of purchase sitewide will decrease meaning you will have a lot of incomplete transactions, missed opportunities and a higher bounce rate… not a good thing when it comes to ecommerce SEO. So you really don’t have a reason not to use multiple payment options on your website because it is another way to convert visitors. Paypal – PayPal makes it easy to get paid securely anywhere you do business: online, on mobile, in person or via an invoice. They are accepted in over 200 markets and 25 currencies worldwide. Stripe – To manage payments, you can set up Stripe accounts for sellers from 25 countries. They also handle billions of dollars of payments a year. Authorize.net – Sell online, mobile or at a store. Accept credit cards, e-checks and alternative payments. Freshbooks – Accounting software that makes running your small business easy, fast and secure. Don’t leave your customers in the dark. Create high-quality product descriptions that give your customers the information they need to make informed purchases. Making the decision process easier will increase the chances of shoppers going through with their sales. Reputation is everything. Ninety-two percent of consumers now read online reviews –as opposed to 88 percent just a year ago. Encourage your customers to leave feedback about your products and services to help build your company’s reputation. High-quality photos are a must, your ecommerce SEO game plan needs it! It’s important to have multiple images of your products, showing your visitors exactly what they can expect. Take multiple photos from different angles in order to showcase the product properly. It’s important for the buyer, as it eliminates uncertainty and questions. Consider a tool like Fyuse to create 3D images, helping your images come to life. Adding in short video clips of your products is a great way to showcase your products and increase sales. They don’t have to be lengthy – the best videos are only as long as necessary. It’s simple, video can help you drive more sales by explaining a product/service better and creating a better sense of trust which essentially means you’ll see a high return on investment from them. Accepted loading time for an ecommerce website is about two seconds, although Google recommends aiming for less than half a second. Your customers expect instant results –if your website is too slow, they’ll click away. Offering discounts and promotions is a great way to boost sales. Consider offering discounts and running promotions for special days, events, or holidays. This is an important strategy for your ecommerce SEO efforts as it will help you drive relevant traffic to your website and increase your conversions. Starting a blog can improve your website’s ecommerce SEO strategy and is a great way to draw in more relevant traffic. Ensure you are visually engaging! Make sure you outreach and share your posts. Don’t expect any results without this! Blog posts are important for ecommerce SEO, but it’s important to ensure your blog posts are addressing the stages of your buyer’s cycle are ultimately tied back to your product and services. Answer your target audience’s questions. They are actions are generally based on searching (problem based, solution based, branded), learning or deciding which is the most actionable stage towards a sale. Write a blog using one or more of your targeted keywords, and if you are able to rank the keywords you use in the post, you will get a lot of visitors which in turn with the proper CTA’s will help you generate more leads. Offering a variety of convenient shipping options is a great way to boost your sales and keep customers from abandoning their carts at checkout. This is an ecommerce SEO tip that is important to test, that way you can optimize for the best conversion rates for your products. Social media is great for building relationships with your customers and getting the word out about your products. Keeping your social media accounts current can help you to establish a sense of reliability and build trust with your customers. Find out a post cadence that works for you and ensure you also interact with your audience. When they ask questions either directly or indirectly find time to respond to them because it will make them happy, feel important, and also see you as an industry leader. It shouldn’t always be about business posts; you can post funny things related to your niche. Your audience are human beings, so interact with them in a way that promotes your company spirit. You will be able to understand their needs and be able to serve them better if you interact more with them. Social media essentially drives more brand exposure and site visitors and that’s why it’s an important part of your ecommerce SEO game plan. Social media isn’t going anywhere anytime soon so why not enhance your customer’s’ experience by making it easier than ever to log in and make their purchases? Consider using Soldsie – a tool that makes it even easier to sell via social media. This tool allows customers to buy products via hashtag, further simplifying the purchasing process. So there you have it! 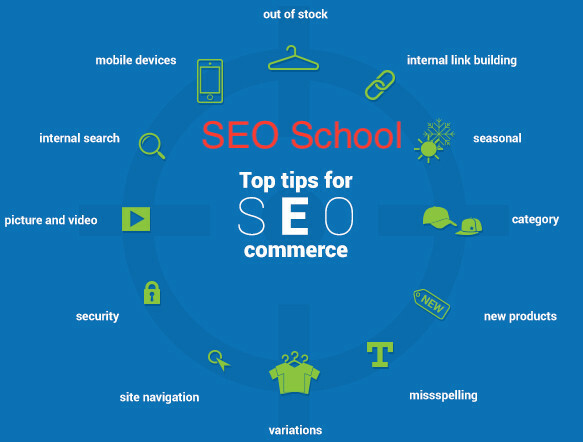 15 ecommerce SEO tips and tactics to increase your sales. When it comes down to it, many of the best ways to improve your conversion rate are all about finding ways to drive relevant traffic to your website – and simplifying the purchasing process for customers. So look for ideas to draw new customers in, and ways to make life easier for your customers – then watch your sales go up. It’s all part of an effective integrated marketing communications campaign, so make sure you tie all these tips into your business marketing plan. Possessive adjectives explained English Beginners course Lesson 5. March 15, 2018 Comments Off on Possessive adjectives explained English Beginners course Lesson 5. Some common Nouns In Spanish lesson 1 of the free course. July 18, 2018 Comments Off on Some common Nouns In Spanish lesson 1 of the free course.